What a wonderful early Christmas present! I love your realistic sense of four-stanza humor! Thank you! God bless you! It's been a long day and I'm happy to end it smiling (and posting!--thank you for the early opportunity). I've written about kids, too! Christmas Eve wishes of wee ones, captured in a Christmas acrostic. Thank you, again, so much for hosting! Thanks for starting us off this week! I love seeing the "our" in humor! Hah! Leave it to you to provide some humor just when we need it most. Wonderful poem! Thanks for hosting, and Happy Holidays to you!! I look forward to reading it in the morning, Jama. And, learning about struffoli. I can't imagine rolling hundreds of little balls of dough and frying them all. Sounds like a lot of work. Delicious work. The peanut butter! Hysterical. Even though the language is straightforward, what you left OUT of the telling makes it feel like a poem. Thanks, Diane, and happy holidays! I've got the PFA for Science and my rhyming acrostic, "Things to Do in Science Class," at http://laurasalas.com/poems-for-teachers/poetry-friday-anthology-for-science-remix/. Thanks for hosting! I'm glad you think it's a poem, Laura, as I said, I had my doubts! Spiderlings in the Christmas Pageant! Love it. Thanks so much for hosting, Diane, and for scattering some of your your inspired light in my world. Merry Christmas! Spiderling is such a fun name for the teensy arachnids. I once wrote an easy reader about spiderlings. It also had a cat in it! Winter's not here in New Hampshire, either! Pat Fargnoli was our Poet Laureate several years back. A nice lady! I think we all have if we've had any Catholic background! Diane, when my husband's Italian grandmother was alive, we always had that dessert on Christmas Eve. Gorgeous and delicious! Ha, ha, Matt, no white stuff in the forecast. Cold, wet, rain today. How soon is soon, Carol? Will we receive it as our Christmas gift? I love the juxtaposition of the slapstick with the sacred in your Christmas poem. Isn't that what the sacred is, after all--the divine touching life in its most real places? I also always enjoy your presentations--graphics and fonts so suited to the subject. I like your definition of sacred, "the divine touching life in its most real places." So true! I always get a kick out of photos of patio furniture covered with snow. It's a visual joke if ever there was one! It's always my 'go-to' picture to show how much snow, without the wind drifts. This time, so smooth and perfect, and thus the poem. There are so many things that can go gloriously 'wrong' when working with children. You've captured it, Diane. My poem isn't Christmas related. I had thought to have a new poem/post for today, but it hasn't happened, so I'm linking to a poem I posted earlier this week, written (belatedly) for my Grandma. It's something I've never tried before - a combination of parts and a recipe, with a whole lot of memories mixed in. I shared it at my Grandma's funeral on the weekend - and was touched at the memories (and emotions) it stirred for my cousins. And others who I hadn't expected to be so affected. You're welcome to drop by for some of Grandma's Pikelets. The thing with working with children is not to expect ANYTHING to go right, then, you can be pleasantly surprised is something does! You found the perfect illustration to go with your hijinks, Diane! Love it. What were you doing up at 4:46 AM, Tabatha? I barely made it up at 7:00. Unless, of course, you were still up, then I would have to assume insanity or insomnia. What a perfectly humanly imperfect tableau! I'm a little in love with Penelope! I played haiku tag this week...with myself. I think we like Penelope because she's us. Ya think? Thank you so much for hosting this week. Here is my contribution at GatheringBooks - Carol Ann Duffy's "Who Loves You"
Thanks for rejoining the Poetry Friday party, Myra! Love this, Diane! I can just picture the whole chain of events. Today I'm sharing "While Eating a Pear," by Billy Collins. Thanks so much for hosting! Cute and oh, so easy to imagine being there! Kids and pageants, a recipe for disaster! I am in sharing the Winter Swap from Dori Bennet today. It's always more fun to watch then to corral the performers. 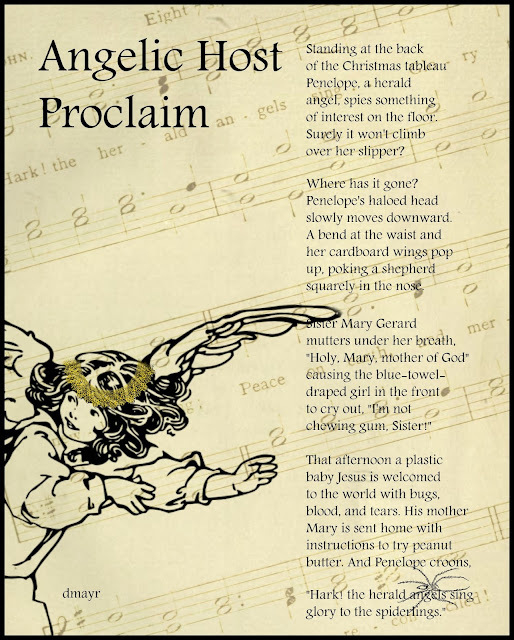 As someone who has helped with many a Christmas pageant, your poem made me laugh out loud! Thank you for early morning joy. This week I'm sharing CHANGES by Charlotte Zolotow, published in what would have been her one hundreth year. Early morning is the best time for joy! I love those pet names--Won Ton and Chopstick! No need for indulgence from me. I loved your poem. I laughed out loud. Wonderful remembrances of Christmas pageants past! I'm sharing a poem from Amit Majmudar at DoriReads. Holiday pageants may be a thing of the past, but I hope they make a comeback. With our rainy grey skies, maybe not so bright! I'll try to keep up the merry end, though. Thanks so much for hosting, hooray! I am sharing my favorite children's poetry books of 2015 over at The Logonauts. As a librarian, I always appreciate lists of books! Happy Holidays! Thank you for hosting. Handsful? Handfuls? There's always that debate. I guess Sandburg decided handfuls was best for his poem! Thanks for hosting. Tabatha's image sent me in a dark direction too before I got myself in a better frame of mind. If you're feeling a little grumpy about winter you might enjoy "Winter," the poem I've posted today. Well, I'm glad you did change frames! I needed a total change of scenery. Happy Friday to you. Thank you for sharing your poem. It made me laugh. The next time I sing it I'll be thinking of spiderlings. I'm in today with a poem on waiting. I found a great quote in the Ferlinghetti poem that I'm going to post some future Friday on KK's Kwotes! Thanks! My selection is "Poetrees" by Douglas Florian. Thanks for sharing his work. Clever poems, clever illustrations, clever layout. Thanks for hosting, Diane, and for sharing your fun poem with a twist! I have a Christmas poem up today-- by Joseph Bruchac from our CELEBRATIONS anthology. Wishing you very happy holidays! Oh, I love that poke in the nose with cardboard wings. Diane! It's not late until a minute after midnight! Joyous greetings to you, with much laughter wished for the new year! I've missed you! I'm glad you're back. I'm in with Richard Wilbur this week, here. Ah, "The Writer"--a good poem always is worth rereading! No post for me this week, but wanted to thank you for the laugh--glory to the spiderlings is going to go through my head every time I hear Hark the herald..
P.S. from me: Just watched and listened to your Julliard video - all trombones!! How WONDERFUL. Glad you liked it! There are quite a number of trombone choirs and videos on YouTube. I'm with Julie -- amazed that an all-trombone group has such variety and depth of sound!! Thank you Diane and other writers of poetry for wakening me up to the beauty of poetry after not being interested in poetry for the past 82 years. Thank you. Thank you, Joseph, you made my day! Diane! Thank you for looking after me and all the other spiderlings this week. I did rush away to school and forget to post my link, so I appreciate your rounding me up anyway. 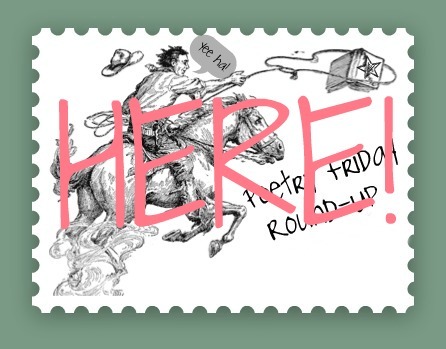 I enjoyed the pageantry of your and appreciate the old-school roundup with editorial commentary. Happy holidays to you and yours! I know how it is to have to rush off to work! Happy holidays, Heidi! Let's just say it's Poetry Week, so you're right on time! What a fun and festive host you are, Diane! Just stopping in briefly to say hello and thank you for the words and wonder. Glad you checked in! Happy holidays and we'll see you on the 8th!